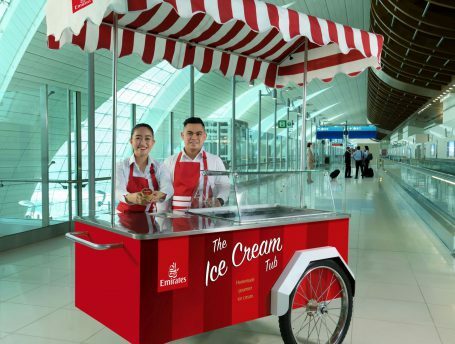 This summer travel season, Emirates is serving complimentary ice cream to all its customers at Dubai International Airport. Ice cream cups will be given out at the Terminal 3 departure and transit areas from 15 June to 31 August for customers travelling from or through Dubai. Emirates continually invests to provide an unmatched travel experience, and this simple but cool initiative is a reflection of its commitment to delighting customers. Emirates’ popular Emperor ice-cream is currently also served in premium classes on select flights to Europe and the UK, and in the seven Emirates lounges at Dubai International Airport. Emirates’ hub in Dubai provides direct connections to over 150 cities across its six-continent network including its latest destinations this summer – London Stansted and Santiago, Chile. The airline offers excellent onboard service, regionally inspired meals and complimentary drinks including a recently refreshed spirits menu. Emirates provides quality products and value for money with lie-flat beds in Business Class, the largest in-seat screens in the world in Economy class at 13.3 inches and up to 3,500 channels of on-demand entertainment on ice, its award-winning inflight entertainment system. Those travelling with children can take advantage of Emirates’ extensive family offering from priority boarding at all airports to special kids’ meals, dedicated children’s entertainment on ice and exclusive toys and Lonely Planet Kids activity bags on board. At Dubai airport, Emirates offers a dedicated family check-in area and complimentary use of baby strollers, ensuring families enjoy a smoother travel experience on the ground. Emirates Skywards, the airline’s award-winning loyalty programme, has also recently introduced an enriched offering called ‘My Family’ which allows family members to pool up to 100% of Skywards Miles earned on Emirates flights, and redeem rewards faster than before.